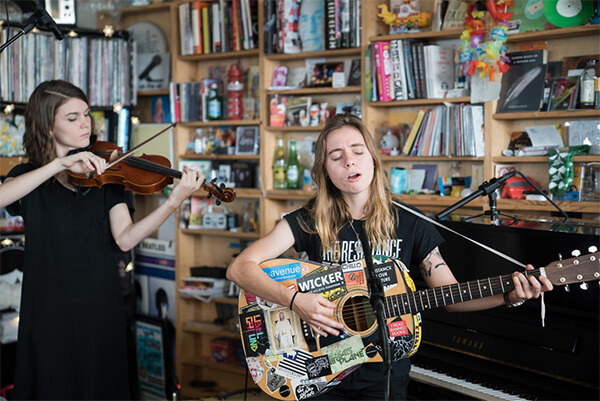 Julien Baker first performed at NPR’s Tiny Desk Concert in early 2016, several months after the release of her debut album Sprained Ankle. Today she becomes one of the few artists to perform at Tiny Desk for a second time. Joined by her touring violinist Camille Faulkner, Baker performed three tracks from her sophomore LP Turn Out The Lights, “Appointments,” “Hurt Less,” and “Even.” This session comes on the heels of Julien’s late night debut, performing “Turn Out The Lights” on The Late Show with Stephen Colbert. Baker has also announced her first U.S. tour dates of 2018 today, through the Midwest and Northeast this spring after traveling to Europe in March with Belle & Sebastian. Tickets for the new dates are on sale this Friday, January 12th at 10am EST.